Can BC be a climate leader? Our new premier has had a busy fall. She's toured the province promoting new coal mines, fossil fuel ports and rail infrastructure as a way to create jobs. She's met with the oil and gas industry to tell them she's tired of hearing people say that they don't want new mines. Most recently, she's traveled to Asia to find new markets for our coal, and financing for new coal mines. It's possible that she hasn't had time to read the latest report from the International Energy Association, which points out that we have just five years to radically reduce fossil fuel use in energy production and industry if we are to avoid being locked in to runaway, potentially catastrophic climate change. It couldn't be any more straight forward: Christy Clark's vision for BC can't be reconciled with what we need to do to survive on Earth. That's why, with help from concerned citizens, we've put up this billboard on the highway to the Tsawwassen Ferry Terminal. We're hoping you can help bring the message home to Victoria, by telling our new Premier that we can't build a sustainable future for BC by opening new coal mines and increasing coal exports. 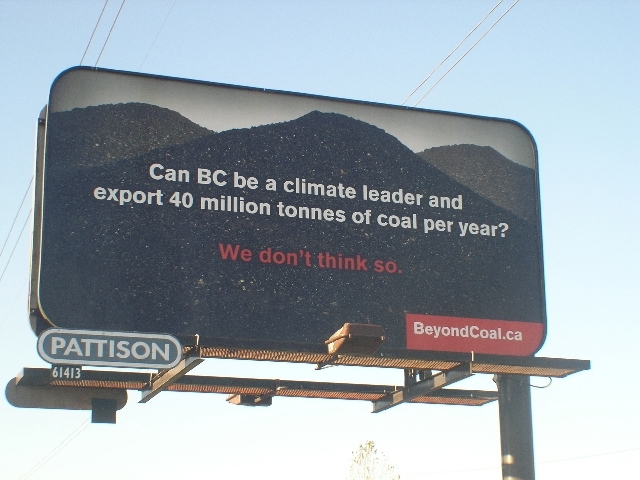 BC already exports huge amounts of coal. In fact, over the past decade, Roberts Bank Coal Port (Westshore Terminals, right next to Tsawwassen Ferry Terminal) has been the largest exporter of coal (and global warming pollution) in North America. Given what we now know about the urgent need to cut fossil fuel use to avoid runaway, catastrophic climate change, that's problem enough. 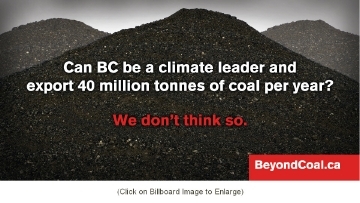 To make it worse, the BC government would like to see BC's coal exports double. This is reckless. It puts our future at risk. For our children's sake, it can't happen. Here's to ending the age of coal in BC!